Taking a shower feels like needles stabbing my head! The sound of that fan is making my ears hurt. I feel like I’m suffocating when you hug me. "… from their earliest years children live on familiar terms with disrupting emotions, fear and anxiety are an intrinsic part of their everyday lives, they continually cope with frustrations as best they can. And it is through fantasy that children achieve catharsis. It is the best means they have for taming Wild Things." When an outsider is simply observing a child’s public behavior -- especially the challenging ones -- it may be difficult for the observer to separate the behavior from the child. It may also be difficult for the observer to see the behavior as a desperate attempt by the child to communicate or cope, and thus it may also be difficult for an observer to step outside of their own world view to see the entire picture -- including underlying influences that may have set things in motion. How much easier it is to blame the child, or the child’s parents for spoiling and not disciplining the child? To parent the right way, or the way the observer believes is the right way? When the casual observer is given a badge of authority, such as observing from the position of educator, those casual observations are given more clout. In the worst scenarios, schools can pin more damning labels onto a child, such as oppositional defiant disorder, or conduct disorder. They often do so without properly assessing a child for underlying issues, including neurological differences -- instead basing decisions on overt behaviors. The result is that instead of supporting the child, the outside focus is on taming the child. 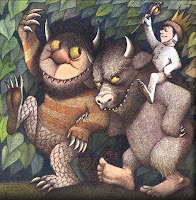 Like Max’s mother from Where the Wild Things Are withholding her son's dinner, educators may use the quickest fixes they have in their toolboxes: the withholding of recess, social opportunities, or desirable activities. Our sensory systems are responsible for detecting sights, sounds, smell, tastes, temperatures, pain, and the position and movements of the body. Sensory integration occurs automatically for most people, and requires minimal effort. For some children, however, the sensory system does not interpret the message the way that others do. In the most extreme of situations it can become like an onslaught of information which is impossible to interpret. It could be that the individual has a Sensory Processing Disorder (SPD), which is a neurological condition that results from the brain's inability to integrate certain information received from the body's sensory systems. Children who have SPD, exhibit challenges in how they interpret and respond to sensory input, often leading to learning and behavioral differences. Sensory Processing Disorder is a hidden disability. It is referred to as that because it is not observable to the casual eye of parents or teachers. Because SPD is not a visible disability, the child may be treated unfairly for behaviors associated with it -- observers assume any associated disruptions are intentional. In fact, many of these behaviors are an effort by the child to regulate their nervous system, which may be on overload. Children with Sensory Processing challenges may react to sensory input in a number of ways that catch parents and teachers off guard. Some behaviors the children may display involve self regulation, including fidgeting, impulsivity, difficulty with transitions, modulating emotions, avoidance, extreme sensitivities, maintaining an upright position, crashing into things (often interpreted as clumsiness or intentional indifference) -- which often results in difficulty interacting with peers. Prior to assuming these are simply behavior problems, and dealing with them via a behavioral approach, it may be helpful to consider other factors. Many of these outbursts are acts of self-advocacy. The role of adults and teachers in these situations is to choose between calm assessment of situations, or making complete disasters of them. If a child is seen as demonstrating avoidance, or as being uncooperative, this identifies the child as disruptive. Poor body awareness can be interpreted as intentions of aggression, and can result in labels which imply intention or purpose (“he meant to do that”), social isolation, and poor self concept. For a person with sensory defensiveness, environmental stimuli can be perceived as an attack, or sensory assault, which is every bit as debilitating as more visible forms of disability. Reactions can be as passive as shutting down/avoidance, or as intense as a full-blown defensive attack on the environment and the people within it. As a response to input, the sympathetic nervous system switches on, and goes into a more primitive protective reaction, “fight or flight.” This type of response is commonly found in children with sensory processing challenges, whose nervous systems may switch into and out of fight/flight mode throughout the day. Though rarely viewed as such, fight-or-flight can manifest as self-protection in the form of hitting, kicking, or pushing as a response to situations such as standing in noisy crowds and lines. It is rarely seen as self-advocacy, however, and children with SPD are often seen as the aggressors -- again, treating the symptoms and the child as the same thing, in this case, as being naughty. As a family, we have lived with sensory processing challenges for many years. Like others, we didn’t recognize its effects until its manifestations were too obvious to ignore, or to attribute to developmental inexperience. Our youngest child showed many of the more disruptive responses of SPD. Prior to being petitioned out of his 2nd grade classroom, our son’s nervous system was switching to fight/flight throughout the school day as a response to the many complex classroom noises, classroom overcrowding, unexpected touch from unknown individuals, and being handed stacks of meaningless and pointless tasks involving paper/pencil work which caused him physical pain. Rather than allowing him to avoid (flight) by retreating under a desk, he was physically restrained and removed from the classroom -- at the request of other parents and the principal -- for years. Ultimately, he was blamed and punished with what amounted to expulsion due to his alternate response -- the only one he had left -- fight. Now, consider the rationale of a seasoned educator placing a child with sensory processing challenges, including personal space and coordination issues, right in the middle of a group of 20-plus seven year olds, on the floor. A misjudged movement where an elbow bumps another child’s nose, a child prone to nose bleeds already -- can be immediately interpreted as intentional when the children who, lacking the specifics of communication refer to a bump as “hitting” which should come as no real surprise. But in Sierra Madre, California, where we live, when that child in question has already been labeled a “threat” -- such a minor incident can end up reported to the police as an assault with the result being that the child is segregated and removed from his educational setting. We wonder how many children with SPD and their parents have faced the stares, and glares, from people watching these children whose nervous systems are on overload ... simply assuming that these children are manipulative brats, and that their parents are completely ineffective and useless role models. We ask, how many people watching such children in crisis have offered words of support and encouragement, a helping hand, or an understanding smile? We wonder how many have instead have stood by in judgment, or spread their misguided perceptions to others in the form of hateful gossip -- perpetuating the belief that these outbursts are due to these children being "bad" or "naughty," or that they require special "handlers" to control them? How many have assumed that these children should be physically restrained during overload, regardless of tactile or other sensory aversions? Well, technically we all do. We pay for the damage in a number of ways. It’s paid for in terms of money -- in the form of lawsuits against the school districts for their failure to provide appropriate supports; the teachers do, in the form of stress and lost trust; and all of the families do, in the form of toxic living and learning environments. Who pays for the damage? Ultimately, it is the children who pay. All of them. They pay for the ignorance of their elders to recognize that there is more to our world than test scores and achievement gaps. They pay with our common humanity because they have been taught to build up walls and borders to keep people who do not look or act the same in some other place. A world that says, "This is mine, and that is yours." Maybe in your world, but not in ours.